any fellow libros out there? LOL – I thought Capricorns are the best!! I try but snore a lot and wake up with the book on my chest. My bed is my favorite place to read. I always read before falling asleep. I don’t think I could sleep otherwise! I’d much rather end my day reading a book than letting my thoughts go where they may, which is usually into worries about the future or reviewing my mistakes of the past. drop that and get into that book! You betcha, Beth. Followed by a sorebackist. Just thinking about it makes me sleepy. I can’t read in bed because I fall asleep. My recliner is the best though! What about the tub? Is there a word for a person who reads in the tub each night? i love tub reading – aqualibroist? Hmm, my bed is reserved for sleeping only. No reading or TV or anything. When my head hits the pillow, that’s the signal to sleep. I dabble in librocubicularism, but in my household it’s the husband who is the *real* professional. 🙂 Thank you for the fancy new word for my résumé! 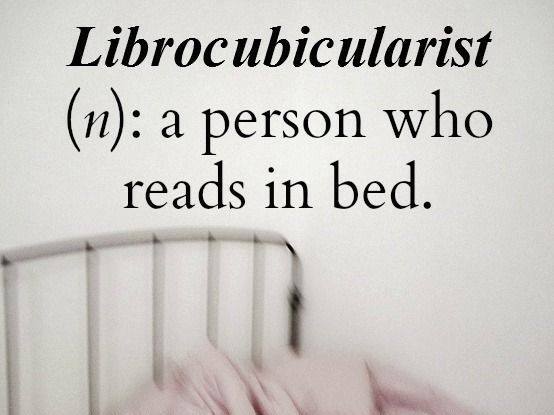 I read in bed so I guess I am a libro too. Occasionally . . . does it count if a student starts by reading in a chair and then passes out on the floor because the reading the book made them fall asleep? I read anywhere including in bed!